Chinese company, iVoomi has introduced its new iVoomi i2 smartphone in Indian market. It is available in Bronze Gold, Indigo Blue, and Olive Black colors for options on Flipkart at a price of Rs 7,499 The iVoomi i2 replaces iVoomi 1i and iVoomi iS and offers a huge 4000 mAh battery, Face Unlock feature, Full View display and dual active 4G VoLTE. 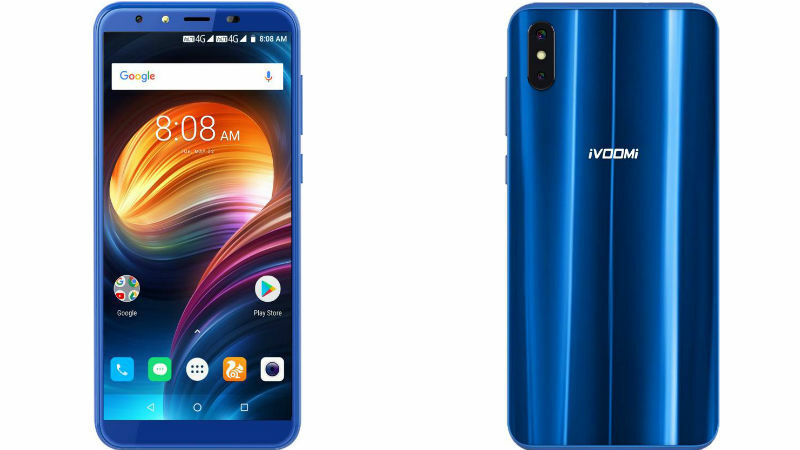 iVoomi i2 offers a 5.45-inch HD+ with a resolution of 720×1440 pixels IPS Full View display with the 3D Mirror Finish Back Panel and operates on Android 8.1 Oreo. The screen comes with screen aspect ratio of 18:9. The device also offers a 32GB storage which can be expandable up to 128GB by using microSD card and is back up by a 4000mAh battery with 2A Fast Charge as claimed by the company.. It has a 1.5GHz quad-core Mediatek MTK6739 SoC and 3GB of RAM. The device comes with a dual rear camera in which first camera with 23-megapixel sensor and second offers 2-megapixels sensor with several attractive features such as panorama soft flash support, HDR mode, Bokeh, portrait, and mode features. There is another camera of 8-megapixel sensor with fixed focus, and face beauty which is placed at the front. It has several features such as 4G VoLTE, Micro-USB port, Bluetooth 4, Wi-Fi 802, GPS, USB OTG, and a 3.5mm audio jack. The company offers one year guarantee and six months on box accessories. There are several sensors on the smartphone such as accelerometer, gyro, proximity and ambient light sensors. The smartphone also offers 3D Mirror Finish Back Panel with 15 layers of optical coating as claimed by the company. There is an exchange offer by Flipkart up to Rs 7,000, 5 percent off for the users of Axis Bank Debit EMIs, 5 percent immediate rebate by Visa cards for first 3 online payments and 5 percent additional rebate for the users of Axis Bank Buzz Card. Flipkart also offer No Cost EMI option for the new smartphone. The smartphone also comes with a facial recognition feature. Have you used these chinese phones? Do they last? The features look too good to be real.. a phone with similar features in other brands would cost around 25-30k!